If you’re ready to replace your home windows and are thinking about the process entailed, don’t fear! Frontline Windows & More is your #1 source for window and door replacement procedures, tips and how-to’s. As homeowners, we believe it is important to understand the basic window replacement procedure, not just to prepare you for the job to come, but to help facilitate fast, efficient performance from your replacement window installer. Here are some tips and FAQs we have gathered to help you, the window installer and your window replacement run as smoothly as possible. How Can I Prepare My House For Replacement Windows? Schedule The Replacement At a Convenient Time – Think about your daily routine and how it involves the part or parts of your home that are being worked on. Prepare yourself and your family for a break in that routine for the duration of the project. You may want to consult with the installer and plan the order in which the various windows in the house will be replaced. It is also wise to make plans to keep pets and children as isolated as possible from the work area. While window installers are used to working around people, distractions such as children and pets will only slow the job down and could even prove dangerous. Clear and Cover Up The Space –Remove and/or cover up any furniture, decoration or other valuable/breakable items that could obstruct window access and any items that might be in the path between the outside and indoor work areas. Don’t forget to uninstall window dressings, and remove any security system sensors on the windows. If you have any window decorations, such as holiday wreaths, on the outside of your home, they will need to be removed as well. Allow For Ample Access – The window installers will need easy access to the room and to the windows themselves. They’ll be carrying the old windows out and the new windows in. Keep the pathways in your home completely clear of obstacles and move anything that might cause an accident or might get in the way. Window Replacement Will Be Messy – Finally, it is important to be prepared for the mess that replacement window installation typically causes. Removing old windows and putting in new ones involves scraping old paint and glue, lots of sanding, installing patches of drywall, and painting. The mess will usually consist of paint (dry, wet or both) and dust on your floors and the outside areas underneath the windows. Your window installer should be as careful as they can, but to take an extra layer of cautiousness, you could put down a drop cloth, plastic sheet or painter paper to catch some of the mess and make your life easier after the installation is complete. Our installation process is unique because we offer you a 3-day cancellation agreement prior to ordering your windows or doors from the manufacturer. This gives you the chance to compare our prices and products with any other company. We will not place any orders before the end of the 3-day period unless you voluntarily choose to do so. Once the order is placed to the manufacturer, it takes 3 weeks for delivery and 1 day for installation. 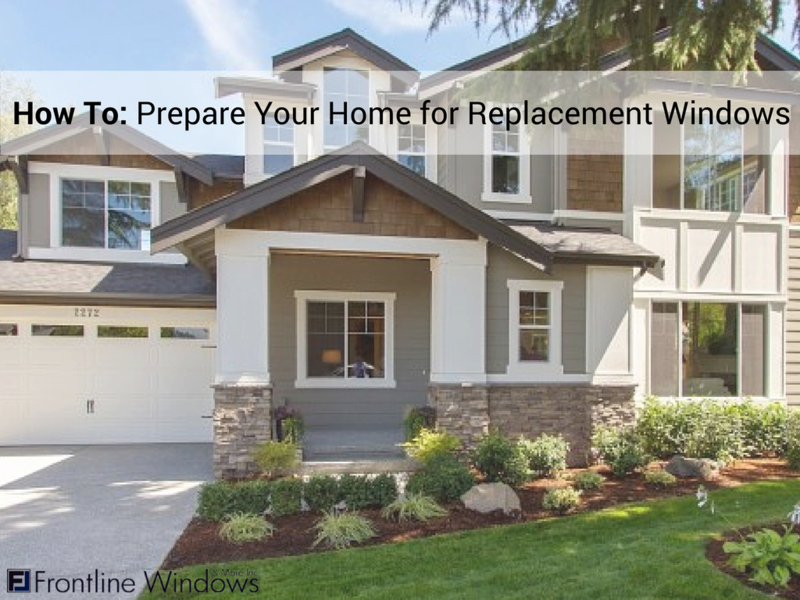 Getting your house ready for replacement windows can take a little time, but it will make the process go more smoothly. By following these tips, you can ensure a smooth installation process. The professionals at Frontline Windows can help you prepare. Contact us for a free in-home estimate.